Google has started rolling out a number of new features to its social network today, including more ways to customise the content you see from your contacts and a different Hangouts interface. Despite the fact a huge number of us have signed up to Google+ and still aren’t using it anywhere near as much as Facebook (not yet anyway), the team appear to be making a big effort to improve the user experience of the site and provide users with what it describes in a recent blog post as, “a more functional and flexible version of Google+”. The new features include a ‘dynamic ribbon’ down the left hand side, which is basically where you can navigate around the social network, move the options (or ‘apps’) up and down, hide them, or hover over them to see even more quick ways to navigate through options. One of the biggest changes has been to Google+ Hangouts, which now has its own dedicated page and makes it easier to talk with contacts and view popular Hangouts among other users. Google has also improved the look of photos and videos too, in an attempt to make people more inclined to share their content. And last but not least, profiles have had a revamp, with much bigger photos and a chat list that sits on the right-hand side of the screen like it does on Facebook, so you can see who’s around for a natter. The changes look interesting and we’re particularly excited to see whether it’s easier to navigate around the site with the new ‘dynamic ribbon’ or as we like to call it THE MENU BAR. However Google, we have a bone to pick with you. What does this sentence EVEN MEAN?! 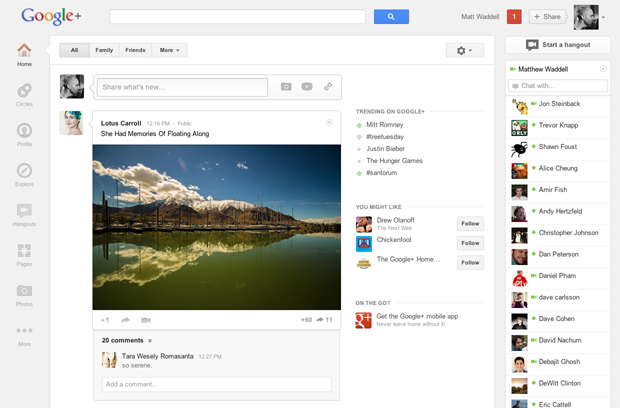 What do you think of the new Google+ design? A Googlewhat?Its dead in the water, the only reason they got so many registered users is because you need a google account to use youtube and or they already had one for gmail. Its not like you can opt out of seeing the google+ at the top left of pretty much every google search page… nowt like having it rammed down our thoats eh google?